How Do You Spell Cover? Home » Spelling Dictionary » How Do You Spell Cover? 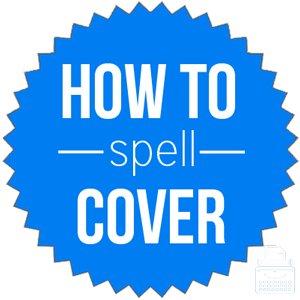 Spelling of Cover: The word cover is spelled c-o-v-e-r. Definition of Cover: Cover functions as a verb and as a noun. As a verb, cover has a variety of meanings. The most common meanings include: (1) to put something or someone on top or in front of something or someone to protect or conceal it; (2) to deal with a subject by examining the most important areas or events; (3) in terms of money, to have enough to pay the bill or cost; (4) to disguise or hide a fact or sound with another fact or sound; (5) in music, to record or perform an alternative version of an existing song performed by someone else originally; (6) to be or become coated in a layer of something. As a noun, a cover is something that lies on, around, or over something, usually to protect or conceal it. It also refers to some type of shelter to which people go when in need of protection. In music, cover is used as a noun to describe the remake of a song originally performed by someone else. Pronunciation of Cover: cover is pronounced kuv-er. What does cover mean? In most uses of the word, cover is used as a verb meaning to shield, protect, guard or conceal something or someone. In other contexts, the verb cover varies a bit but, generally, maintains the same sense of its meaning. You should cover the salad so that flies do not get in it. Do no walk in here because your boots are covered in mud. The coach told him to cover the tallest player on the opponent’s team. As a noun, a cover can refer to many things: from a lid or other material used to protect or conceal something, to an alternative version of a song originally performed by another artist, to an alternative identity intended to protect a person’s true identity. The local band performed a cover of the famous band’s original. They took cover from the storm in a nearby barn. Cover up: To put on clothing or extra clothing to hide one’s body or to stay warm in the cold. Cover (one’s) tracks: To conceal or hide one’s tracks or trace in order to evade followers or pursuers. Cover ground: To travel a certain distance at a satisfying pace. Take cover: To find something under, in, or behind which to hide and/or be protected from danger such as storms or gunfire. Undercover: To conceal or protect one’s identity by assuming an alternative, false identity, as police officers often do. According to Merriam Webster’s, the first use of cover was in the 13th century. The word comes from Middle English coveren which comes from Anglo-French coverir, covrir, and from the Latin word cooperire. The latter being formed from co- + operire meaning to close or cover. Since cover is both a noun and verb and has several meanings as both parts of speech, it’s important to choose the right synonym for the given context. The word cover functions as both a noun and a verb. It has many meanings that are all related, though the nuance of the context is important.